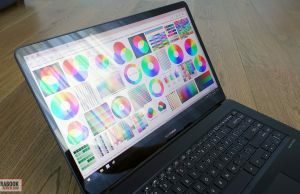 Summary: On paper, the Zenbook Pro UX580 is a stunning computer for content creators and graphics professionals: it looks great, is built well, it comes with a wide-gamut 4K touchscreen and an excellent hardware configuration with the mobile Coffee Lake Core i9 processor, GTX 1050 Ti graphics and fast storage. In real life, this 2018 update inherits all the quirks of the 2017 models, and I'm not sure that interesting LCD screen placed beneath the trackpad and the aggressive pricing are enough to justify picking this over the competition. 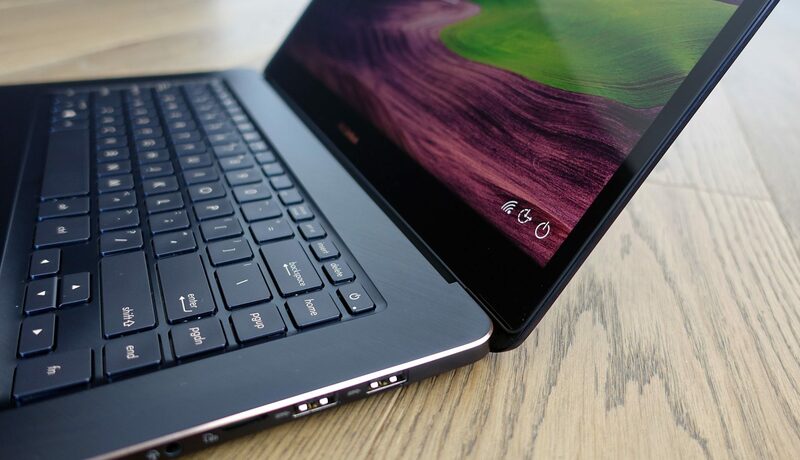 The Asus Zenbook Pro is a series of thin-and-light 15-inch laptops with premium builds and aesthetics, but also powerful hardware and good screen options. 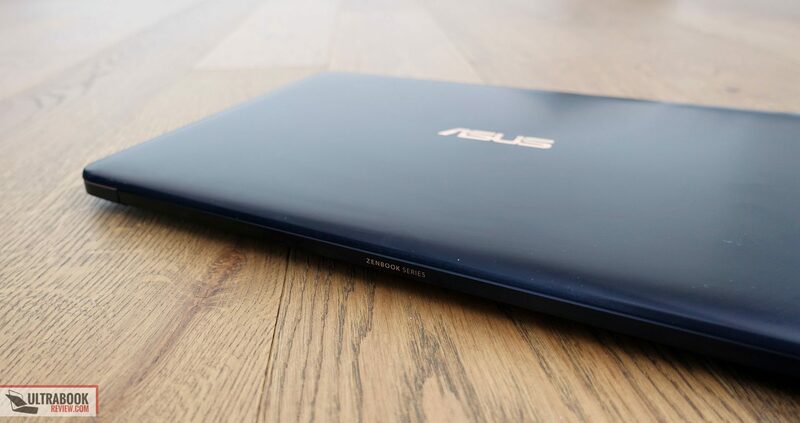 We’ve covered the UX550 lines in depth here on the site in previous articles (UX550VD, UX550VE and the updated UX550GD/GE), but Asus also announced another update in this series for 2018, the Zenbook Pro UX580. 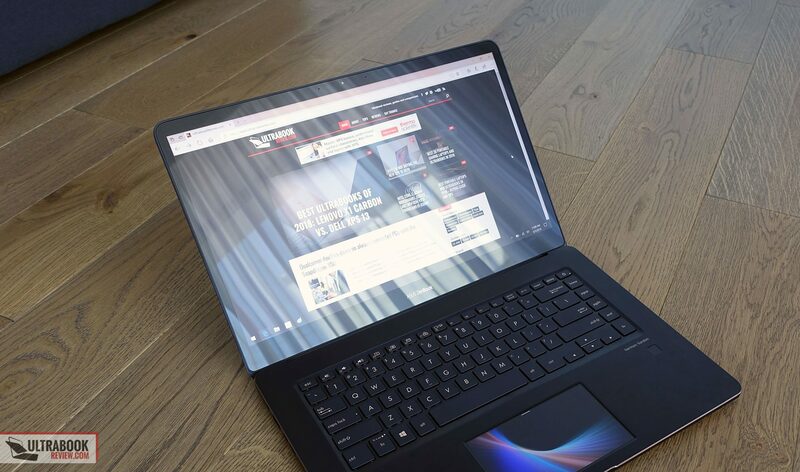 This shares pretty much all features and quirks with the other 2018 Zenbook Pros, namely the UX550GD and GE, but with one interesting addition: an LCD integrated within the touchpad, with a few particular functionalities that we’ll discuss about in the article below. 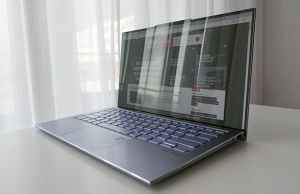 We’ve spent some time with an early sample of the Zenbook UX580, the higher end configuration with the Core i9-8950HK processor, 16 GB of DDR4 RAM, GTX 1050 Ti graphics and the 100% Adobe RGB 4K IPS touchscreen, and gathered all our impressions in this preview article. 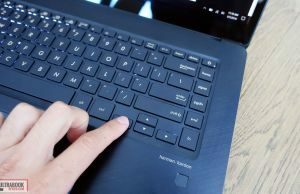 Read on to find out where this laptop shines and where it falls short, how the i9 processor performs inside a compact body and how this 2018 Zenbook Pro compares to the competition these days. 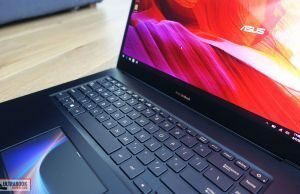 The 2018 update of the Zenbook Pro inherits most design lines and build characteristics from the 2017 models, which we’ve covered in depth in this article, so we’re not going to focus much on this aspect in here. However, there are a few changes that are worth mentioning. First of all the UX580 is only available in a Deep Dive Blue color scheme, with some subtle golden accents on the lid-cover and around the interior. The golden parts might be a little too bling for some, but I have to admit that overall, this combo looks stunning. What’s changed from the previous line is the fact that the interior gets a brushed texture that looks nice, hides smudges a little better and should age better than the smooth finishing of the previous Pros. On top of that, while there’s still some flex in the keyboard deck, especially towards its upper part, I feel this UX580 is a little sturdier built that the older UX550s, but I don’t have the two side by side for a direct comparison, so this could be just a skewed impression. In theory the build shouldn’t have changed, but my UX580 is also a little heavier than the older UX550s, weighing 4.4 lbs on my scales (although Asus claims it weighs 4.15 lbs, and my scales are well calibrated). So I’d reckon some things have changed on the interior and this could have affected the build. The inner chassis is still made out of plastic, with just a shell of aluminum on the outside. There are also a few other slight exterior changes. 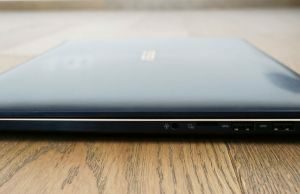 The Zenbook UX580 no longer gets up-firing speakers, which have been instead moved on the underbelly, like on most other Zenbooks. And speaking of the underbelly, you’ll notice there’s still no intake-grill on top of the CPU/GPU, and even those side grills from the UX550VD/VE were removed in order to accommodate the speakers. 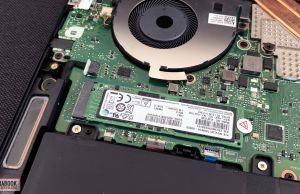 That’s worrisome given the kind of hardware Asus crammed inside and the thermal issues of the 2017 models, but we’ll get to that in a bit. 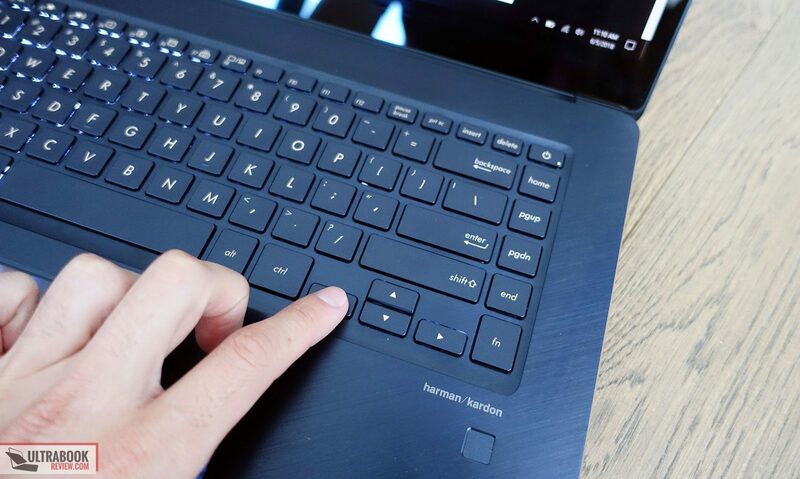 One final slight change regards the fingerprint reader, which is no longer integrated within the trackpad, but was moved beneath the arrow keys, again something characteristic to the entire 2018 Zenbook line. Pretty much else stayed the same, including the IO, the keyboard layout and the screen’s hinge, which is still fairly stiff and will require both hands to lift up the screen, but at least keeps it as set-up even when poking your fingers at it. There’s still no full-size SD card reader, which might not seem like much, but it’s actually an important flaw for a computer meant for content creators and professionals. 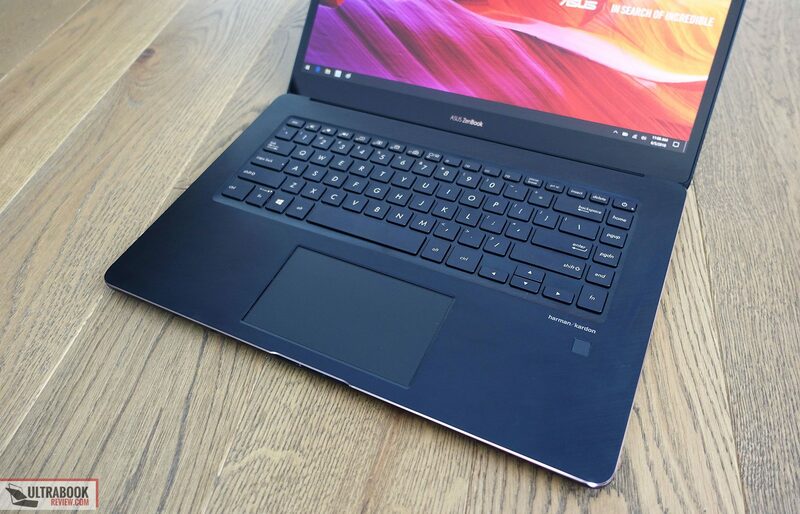 I wasn’t very happy with the typing experience on the 2017 Zenbook Pros, and while the keyboard itself seems identical on this 2018 Zenbook Pro UX580, for some reason I got along a little better with it. I feel this is due to the improved rigidity, which translates in less flex in the keyboard deck. The layout still needs some time to get used to, with that extra row of keys on the right and the Power Button integrated as the top right key, and the feedback is still rather soft and mushy, but give it some time and I’d reckon you’ll get along well with this keyboard. The keys are of course backlit, and the writing is also golden, which maintains an overall design unity. They’re also fairly quiet, so typing in quiet places won’t bother those around you. The trackpad one the other hand is new and really nice. 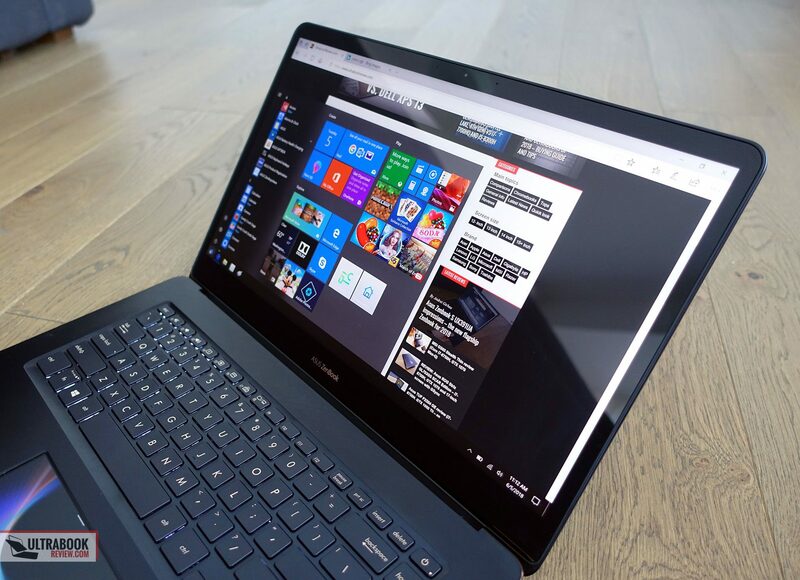 It’s a large Microsoft Precision clickpad with a glass surface that feels excellent to the touch and performs well with everyday use, including gestures and taps. The physical clicks are a little soft, but they still work fine. 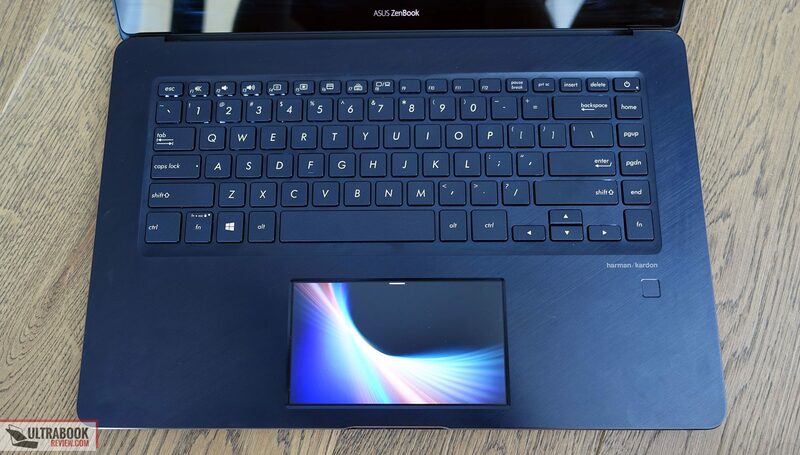 The big selling point of this entire Zenbook UX580 line is the 5.5-inch LCD screen placed beneath the trackpad, which Asus dubs as a ScreenPad. It can display various widgets and functions. For instance, you can use it as a NumPad, as a way to control the music running on the laptop, as a calculator or Youtube player. 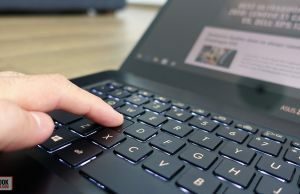 It can also be used to quickly launch various apps on the computer, like a browser or Word, and in certain apps (Premiere, Photoshop, Office) it can double up as a side-screen with quick action shortcuts. 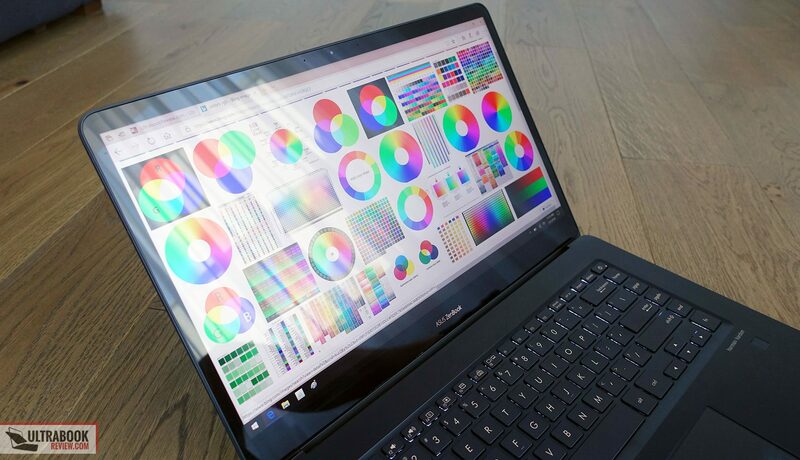 It can also be used as a secondary display in Windows, so can extend your desktop, run a game or a movie, like on any standard dual-display setups. 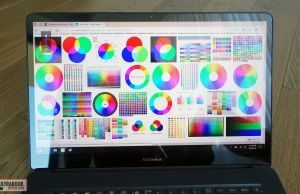 Given this article is based on a pre-production sample of the UX580, the functionality of our sample was pretty limited. 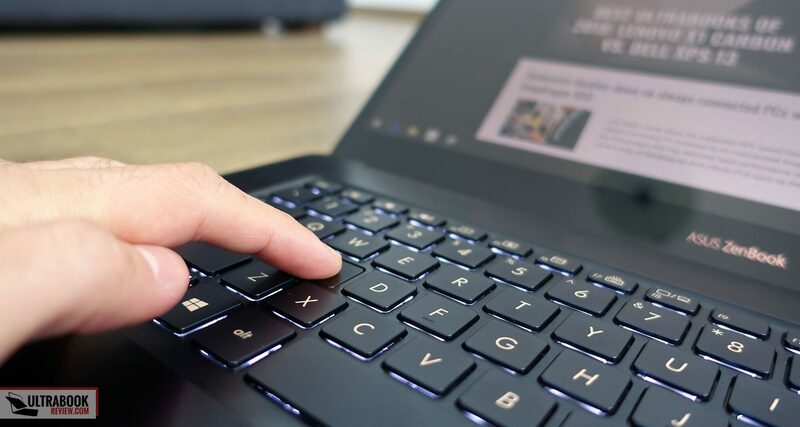 But even so, I do think this ScreenPad is not just one more gimmick, especially for professionals who use complex applications, with a mouse connected and the touchpad acting as a secondary screen for quick controls and adjustments. 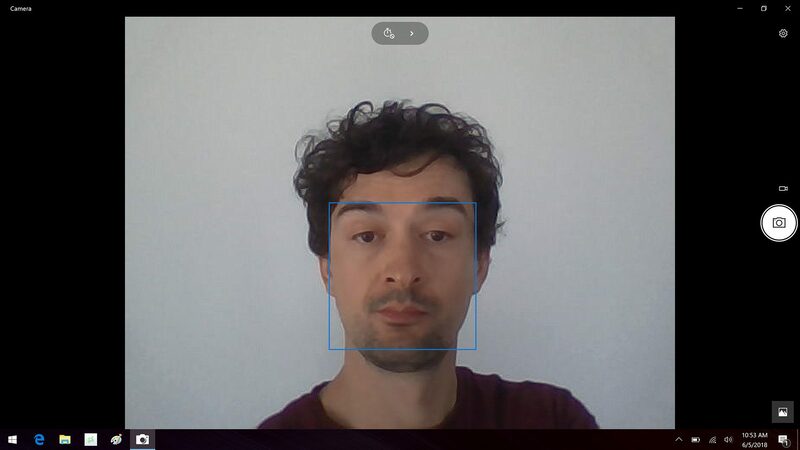 You’ll find more examples of how this works and what it can do in the two videos below. 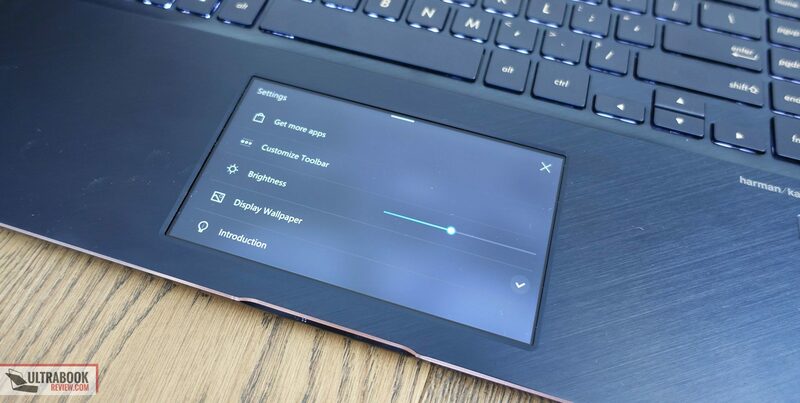 You should be aware however that having the ScreenPad activated will take a small toll on the battery life of about 1 to 1.5 W per hour at 50% brightness, but you can adjust its brightness from the settings, disable its background image or even turn it off completely by hitting Fn+F6. 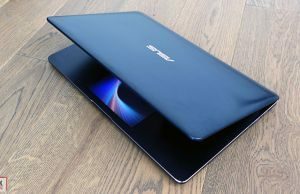 The Zenbook Pros are available with either a matte FHD or a touch UHD 15.6-inch screen, and we got to test the latter, which comes with a competent AU Optronics B156ZAN03.1 panel, the one Asus also uses on the 15-inch Zenbook Flip UX561. 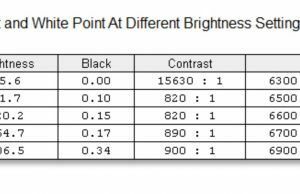 It’s bright, gets good contrast and wide-gamut color reproduction. 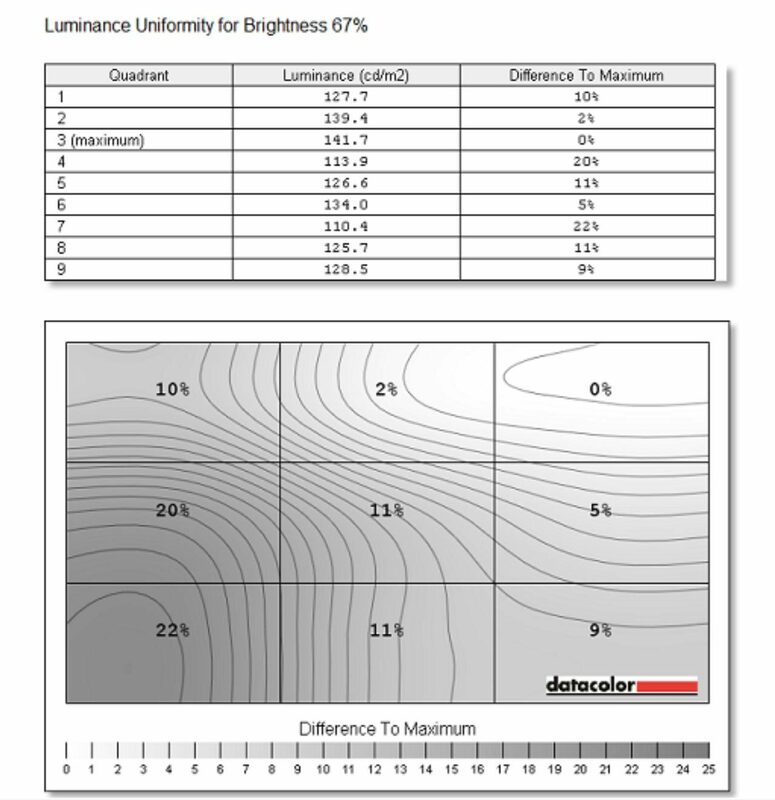 It’s also well calibrated out of the box, but you can give our calibrated profile a try as well. More details below. 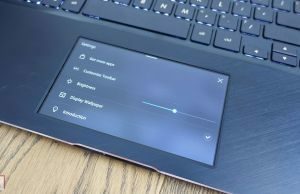 These aside, you should also know that this panel doesn’t use PWM for brightness modulation, and the touch supports Asus’s Pen, which is not included and probably doesn’t make much sense to use on a clamshell laptop anyway. 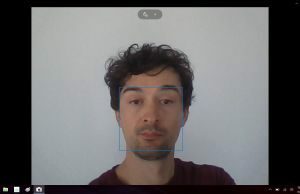 There is however one aspect where I found this panel to be a bit deficient: uniformity, with the lower left corner about 20% dimmer than the top-right corner, according to our tools. 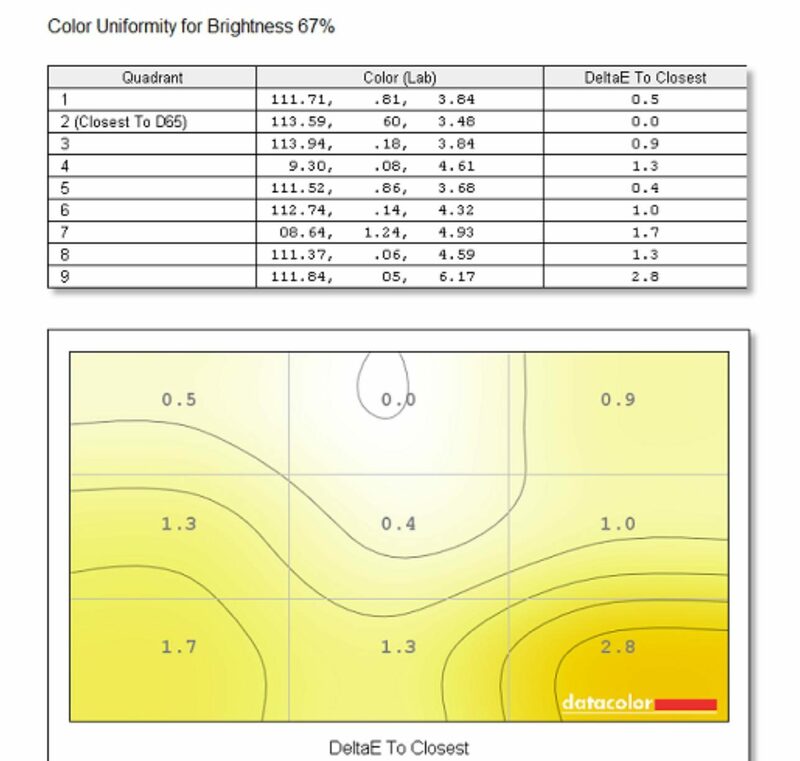 There’s of course also the matter of visibility in bright life, because while the panel is moderately bright at a little over 300 nits in its middle, you’ll still struggle to use it outside or in other brightly lit environments, with all the glare from the glass on top. We got to test the highest end configuration Asus offers for the 2018 Zenbook Pro, with the Core i9-8950HK processor, 16 GB of DDR4 RAM, Nvidia GTX 1050 Ti graphics and a 1 TB PCIe SSD. However, out sample is an engineering sample, so you should take our findings with a lump of salt and make sure to read other reviews once the retail models are available in stores, as some of the aspects we’ve discovered might improve by then. 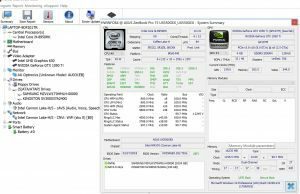 There are a few aspects to keep in mind when it comes to the hardware configuration. First of all, the RAM is soldered on the motherboard, so there’s no way to get more than 16 GB on this notebook. 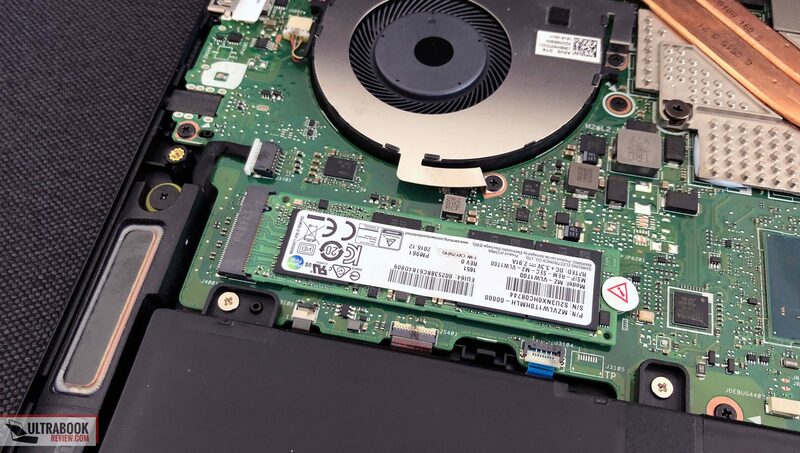 The SSD on the other hand can be swapped, if you opt for a lower end model and plan to upgrade it yourself. 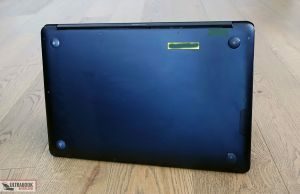 Accessing the internals is fairly easy, you’ll just have to get past the back panel, which is hold in place by the ten Torx screws visible around the sides. 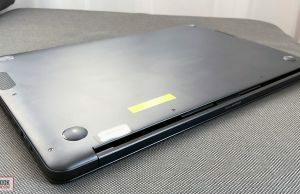 There are no screws hidden behind the rear rubber feet, like on other Zenbooks. Inside you’ll also notice the wireless chip, but aside from the Wi-Fi and SSD, everything else is soldered in place. With these out of the way, let’s jump to the elephant in the room: the i9-8950HK processor. 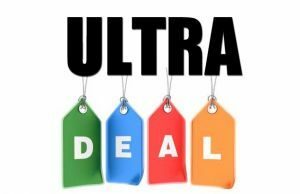 This is a 45 W processor with higher Base Clock Speeds and Turbo Speeds than the more standard i7-8750H, but also a hefty price premium or around $200. 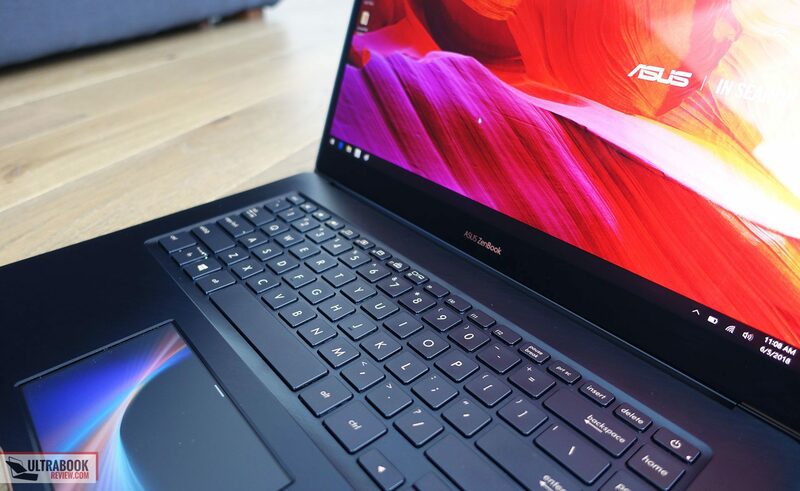 Normally, this kind of processor is made for workstations and high-performance full-size notebooks, but some OEMs decided to implement them in thinner builds, like this Zenbook Pro. Again, I must stress that the unit we got to test it pre-production and you should take our findings with a grain of salt. 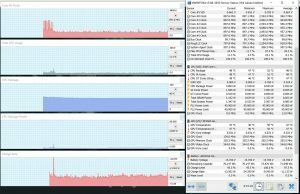 However, I find the results on par with what I was expecting, given our experience with the UX550VE (i7-7700HQ and GTX 1050 Ti) in the past and the fact that Asus hasn’t updated the cooling on the Zenbook UX580: the i9 processor cannot maintain its potentially high Turbo Speeds in demanding loads. 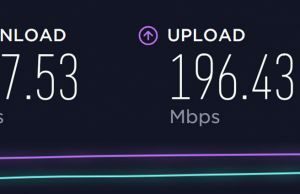 It never throttles per-se and goes beneath the standard clock speeds of 2.9 GHz, but the Turbo speeds drop low enough so the implemented i9 does not perform as well as on thicker computers, which was absolutely to be expected. 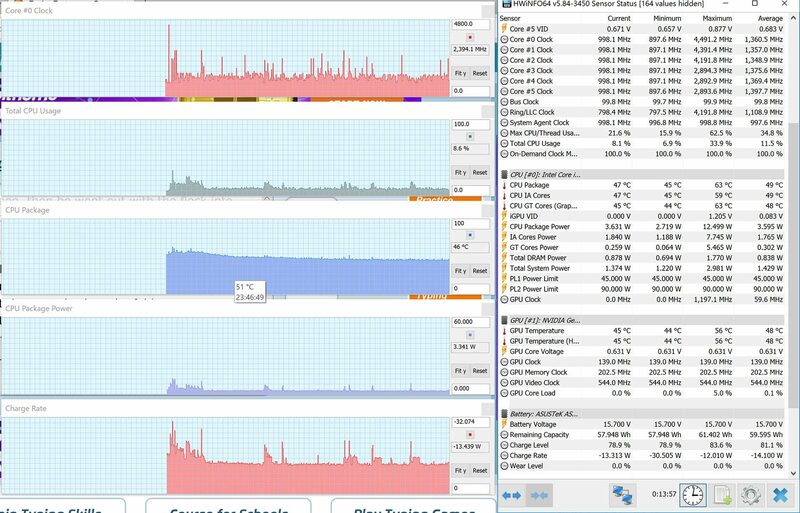 For once, the CPU power drain was limited to 45W on this sample, while other implementations allow higher drains for short periods of time, which allows the processor to run at high Turbo Boost speeds for at least a few seconds. 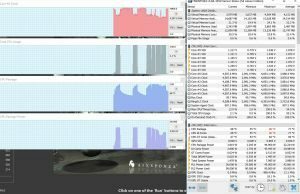 This translates in lower benchmark scores and out of the box, our sample only returned Cinebench R15 Multi-Core scores of around 1050 points, which is even a little under an average i7-8750H implementation. That’s due to the fact that the CPU heats up quickly to 95-97 degrees Celsius and the frequency is quickly thermally limited to prevent the die from reaching high temperatures. 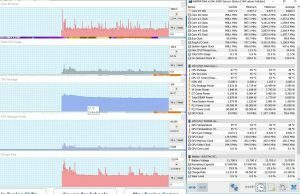 Undervolting helps to a fair extent, and this guide explains what undervolting is and how it can be performed. 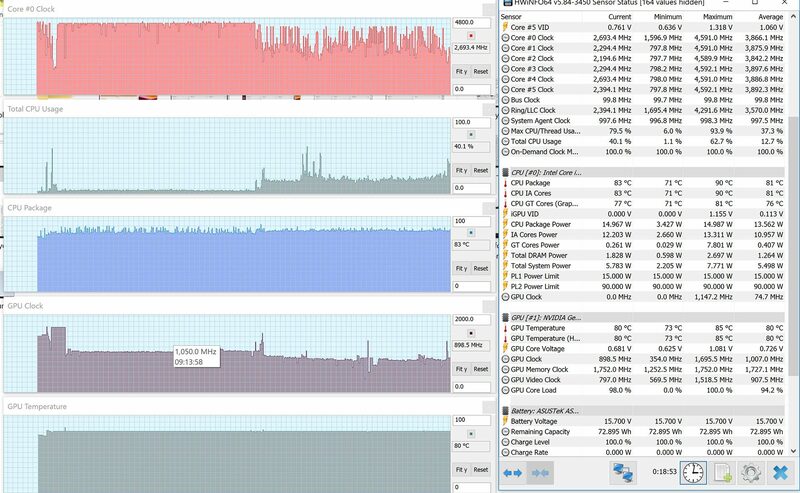 Our sample ran perfectly stable at -120 mV and this translated in an overall increase of 7 to 15% in benchmarks, due to the fact that the CPU takes longer to heat-up and runs at higher-clocks in continuous loads. 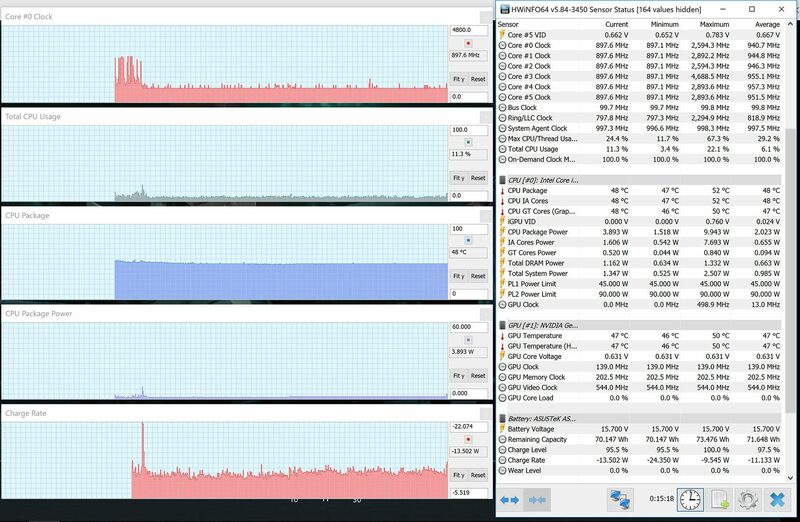 While out of the box the cores stabilize at around 3.0 tot 3.2 GHz with several Cinebench runs in a loop, with undervolting they run at 3.4-3.6 GHz in the same tests, hence the performance boost. 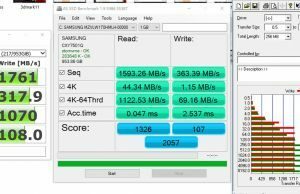 That’s still a fair way from the 4.5 GHz maximum Turbo Boost the i9-8950HK can theoretically maintain with 6-core loads, and thus the benchmark results we’ve got on the UX580 are far from what other full-size implementations of the i9 processor deliver. 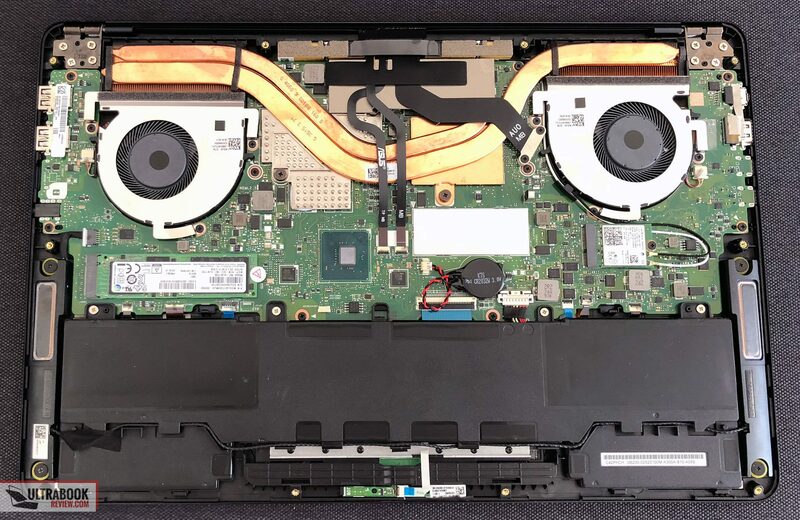 But again, that should come to absolutely no surprise, if you were expecting the i9 to run the same inside this laptop as inside the MSI GT75 Titan, well, come one, get serious. 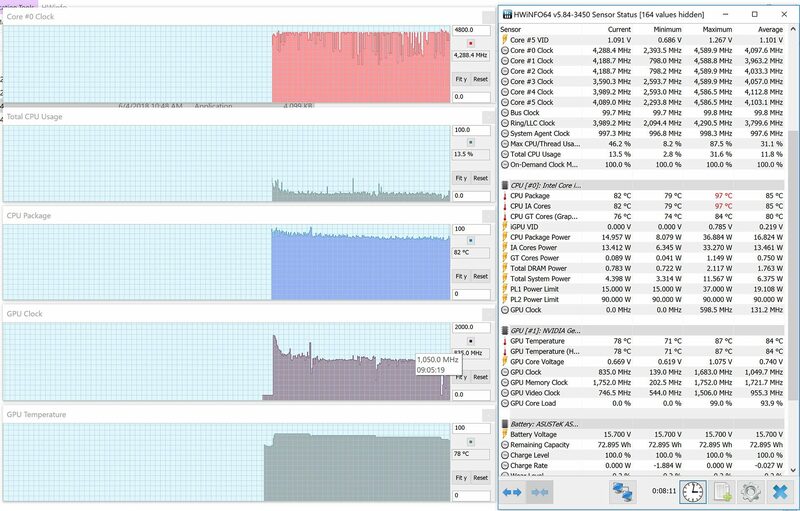 x264 HD Benchmark 4.0 32-bit: Pass 1 – 204.00 fps, Pass 2 – 69.73 fps. 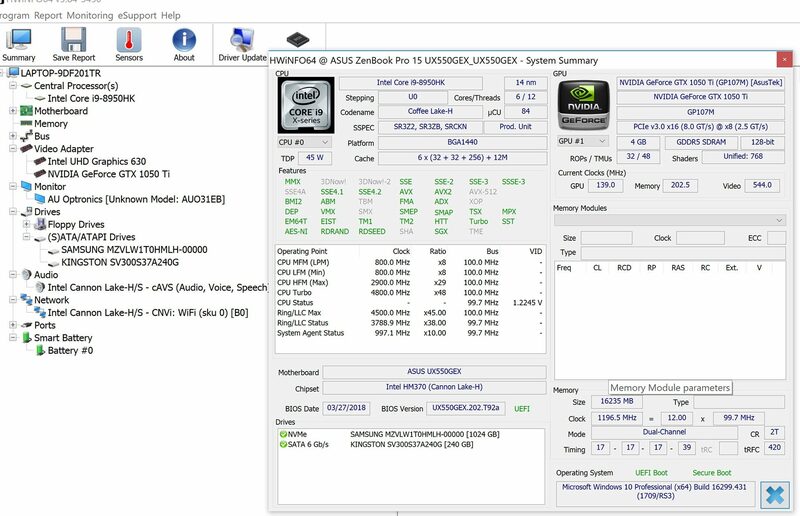 We should also mention that the i9-8950HK is an unlocked processor and can be overclocked by boosting its Turbo Frequencies or upping the multiplier. However, that has no impact on performance, due to the thermal limitations. So when we draw the line on this short preview, the i9-8950HK makes little sense imo on such a computer and I’d advise you to save your money and go for the i7-8750H models instead. However, you should read other reviews of retail i9 implementations, to get a better picture of what to expect, and not draw a conclusion based on our findings alone, which are based on a pre-production sample. 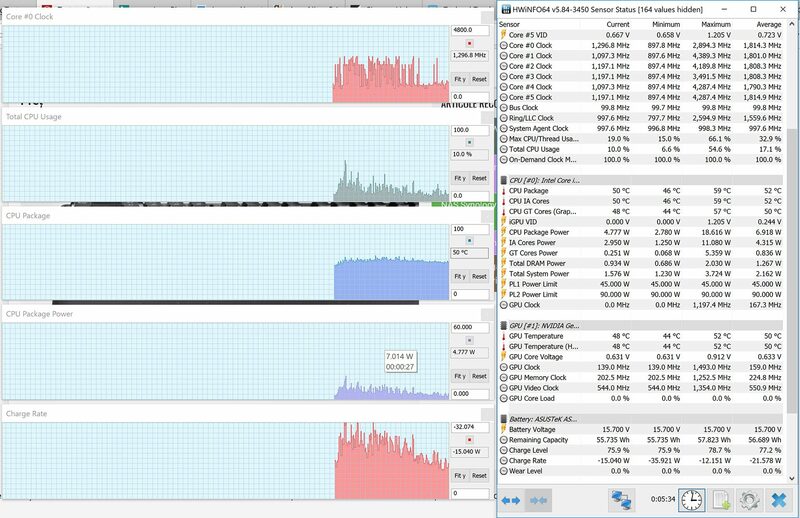 Compared to last year’s i7-7700HQ implemented in the Zenbook Pro UX550VD/VE, the i9-8950HK on this Zenbook Pro UX580 is of course significantly faster, but that was never a debate, since it gets 50% extra cores and threads, plus runs at higher clock speeds. The debate is which of the Coffee Lake processors makes the most sense on such a build, and while I’ve yet to test the i7-8750H on this 2018 Zenbook Pro, I’m pretty sure it’s going to perform within hairlines of the i9, for a fraction of the cost. CPU aside, there’s also the matter of GPU performance. 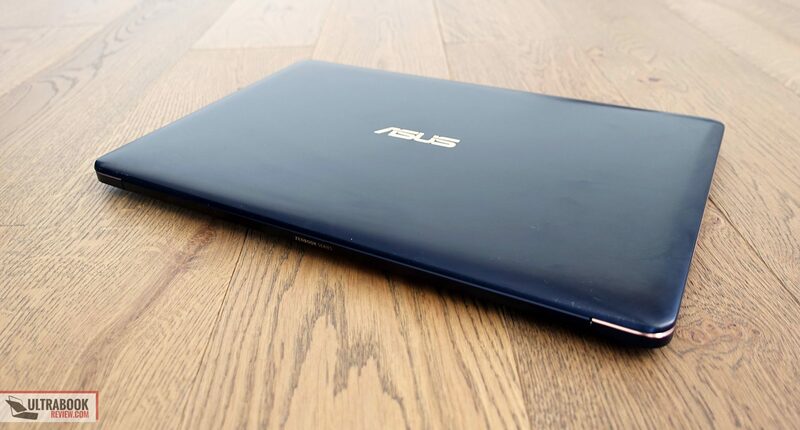 Asus stuck with the full-power version of the Nvidia GTX 1050 Ti for the Zenbook Pro UX580GE, and it comes to no surprise it heats up and drops in performance with long gaming sessions. 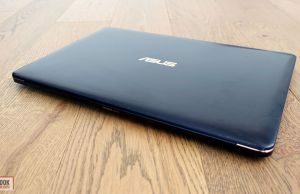 We’re not going to get into details here, since this test unit is pre-production and we might draw some hasty conclusions, but our unit performed pretty much like the Zenbook UX550VE we’ve tested in the past in games, with slightly higher framerates in the first few minutes or launching a game, which dropped as the GPU’s Clock Speed was thermally limited. 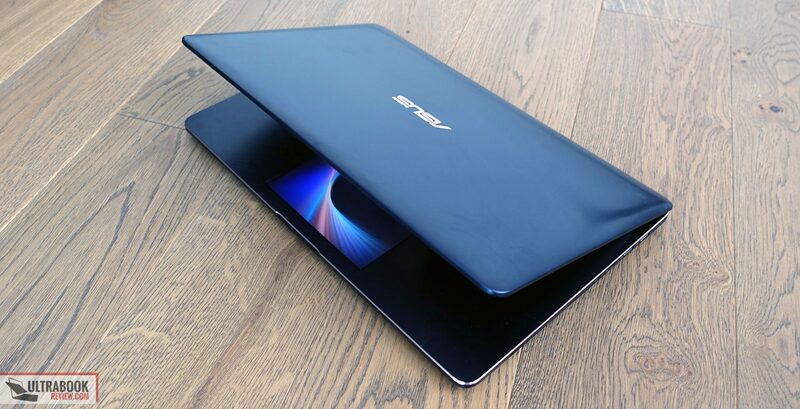 I find it odd that Asus didn’t address the cooling on the 2018 Zenbook Pros in any significant way, given the feedback on the thermally limited performance of the 2017 models and people’s complains on Reddit and the forums. In fact, the 2018 updates get even more obstructed air-flow, as those two intake meshes on the belly are now smaller and were moved lower, on top of the now rear-facing speakers. 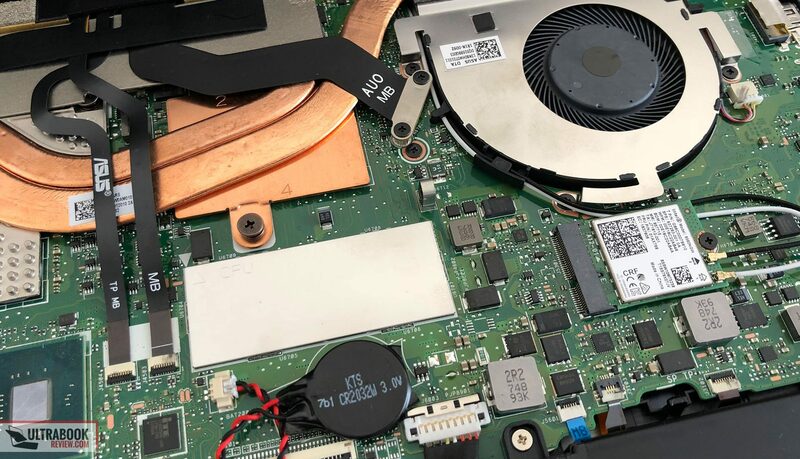 The cooling is still very basic imo for a thin laptop with this kind of hardware, with two fans, one joined heatpipe for both the CPU and GPU, an extra smaller heatpipe for the GPU and a third heatpipe hidden on top of the motherboard. The fans are supposedly upgraded and use better materials for the fins, which should translate in an improved CFM. In real life, these fans are fairly quiet, pretty much inaudible with daily use (which is good), but also not that loud with demanding loads, averaging about 45-46 dB at head-level. I’m definitely not complaining about them being quiet, but the entire cooling just can’t properly cool the hardware Asus put inside this computer. 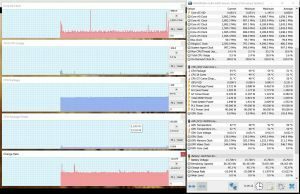 That’s why the Zenbook Pro UX580 runs fairly warm with daily use and gets fairly hot with gaming, especially on the back. Still, at high 40s, those temperatures aren’t that high and this definitely doesn’t get as hot as something like the MSI GS65 and other thin laptops with powerful hardware, but let’s not forget this only bundles a mid-range GTX 1050 Ti running at sub-par frequencies due to thermal limitations. If the final retail units are going to perform better, I’d also expect the shell to get warmer with loads. 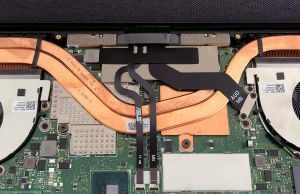 Connectivity wise the 2018 Zenbook Pro gets an updated Wave 2 Wireless AC chip with Bluetooth 5.0. This allows faster wireless performance when paired with matching routers. 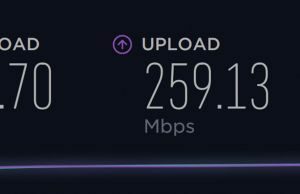 The speeds do drop a fair bit at 30 feet with 1 wall in between, but I never struggled with reception or encountered any other issues with the connection during my short time with the UX580, so I don’t have anything to complain about its wireless capabilities. The speakers on the other hand have been moved on the underbelly and while the 2017 models got quad-speakers, the 2018 updates only get a set of two. They’re still fairly loud and the sound quality is above average, so without having the two generations side by side for a direct comparison, I can’t say these can be perceived as a downgrade in actual use. As far as the webcam goes, it’s still the same crap VGA one Asus insists on plastering on all their Zenbooks, and if you actually use the webcam on your computer, you’ll have a hard time accepting such a poor one on a premium device. 21.5 W (~3 h 15 min of use) – browsing in Edge, Balanced Mode, screen at 30%, Wi-Fi ON. 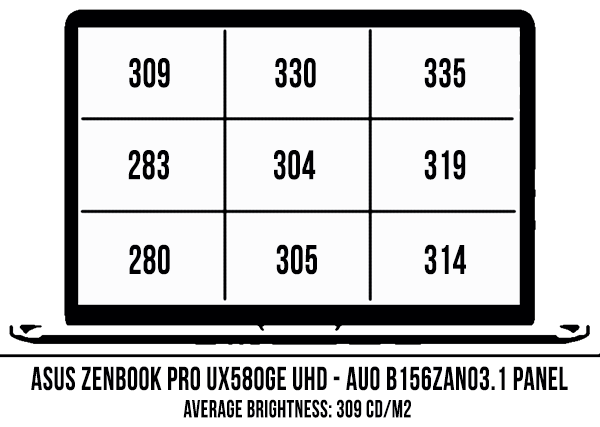 Keep in mind that we had the ScreenPad active with all our tests, with its brightness set at 50%, and this takes an extra toll of roughly 1 to 1.5 W. The UHD screen takes its toll as well, and while you can mitigate the loss by disabling the ScreenPad, you’ll just have to accept that a higher res panel is more power hungry when buying this laptop. The UX590GE comes with a fairly chunky and heavy 150 W power brick that weighs .54 kg with the included cables (European version). It’s not bigger than the 120 W bricks on the older UX550s though. 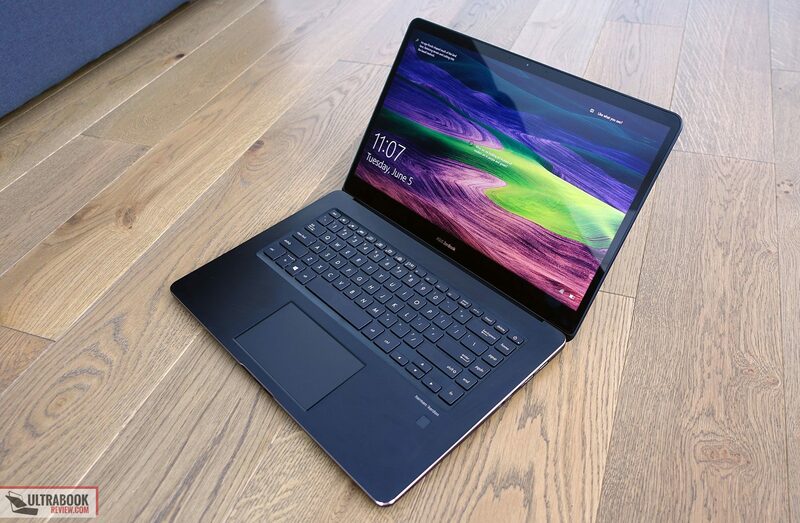 The Zenbook UX580 is listed in stores around the world. In Europe, the base configurations with the i7 processor, 8 GB of RAM, 512 GB SSD, GTX 1050 graphics and FHD screen start at around 1700 EUR. 2000 EUR would get you an upgrade to 16 GB of RAM and the UHD screen, while the i9 configurations with GTX 1050 Ti sell for around 2300 EUR. In the US, the base models start at around $1799, with the i9 version listed with an MSRP of $2299. 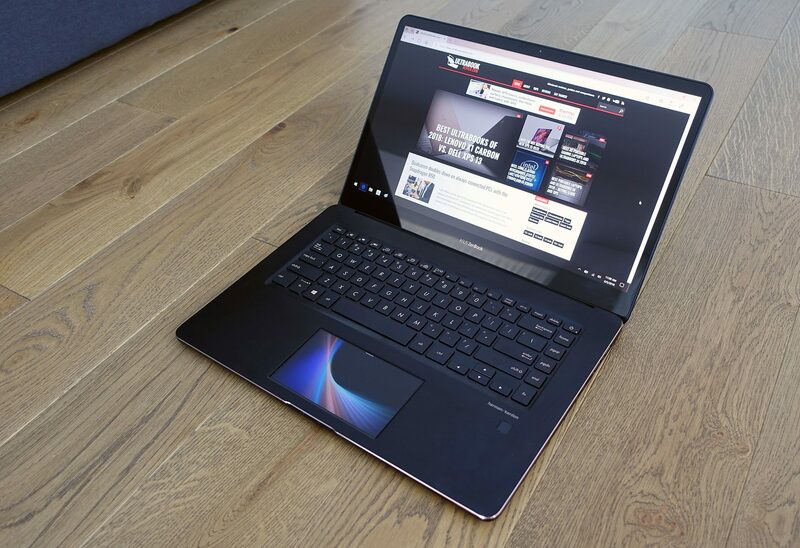 On paper the Zenbook Pro UX580 is a stunning computer for content creators and graphics professionals: it looks great, it’s built well, it includes a wide-gamut 4K touchscreen and an excellent hardware configuration with the mobile Coffee Lake Core i9 processor, GTX 1050 Ti graphics and fast storage. In real life this 2018 update inherits all the quirks of the 2017 models, with the only update being an interesting LCD screen placed beneath the trackpad, which I’d reckon many will actually find useful, but it’s not enough to compensate for the flaws. When we draw the line, there’s not much to complain about this laptop’s design and build, keyboard, screen quality, IO and even battery life, although I do have nits with most of these as well: there’s no SD card-reader, there’s still some flex in the keyboard deck, the keys are a bit mushy and the screen is only averagely bright. On top of that, there are options out there with arguable better screens, sturdier builds and larger batteries. 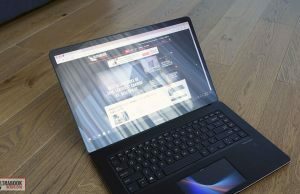 The Zenbooks usually compensate with a more affordable price tag, but I’m not sure that’s going to be enough this time around. The cooling implementation is still the major culprit for the 2018 Zenbook Pro, especially on this high-end configuration with the i9 processor and GTX 1050 Ti graphics. As far as I can tell right now, you’re basically expected to pay extra for the more powerful hardware, but without getting the matching increase in performance. That’s why last year I mostly recommended the i5 + GTX 1050 configurations of the Zenbook Pros, and this year I’d stick with those as well, especially with the updated Coffee Lake i5-8300H being much faster than the Kaby Lake i5. 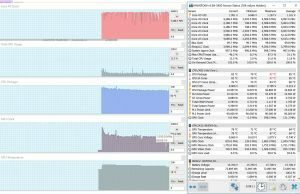 The i7 + GTX 1050 Ti models could be an option for some of you that are looking to benefit from the extra oomph of the six-core builds and faster graphics, but be prepared to undervolt and repaste them (careful though, repasting voids warranty), and even after all these tweaks still accept that you’re not going to get the performance thicker implementations can deliver from the same hardware. 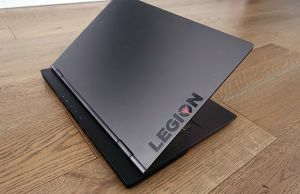 As for the i9 configurations, well, I don’t think they’re worth paying extra for, and not just on this Zenbook, but on other similar designs as well. 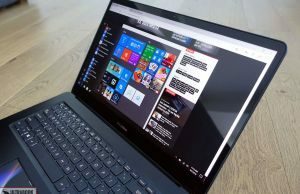 At the end of the day the Zenbook Pro UX580 is still a good computer, and for the right price it can be an option to consider. 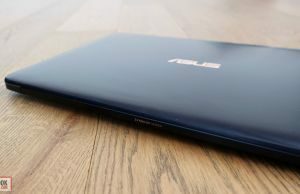 But I can’t hide my slight disappointment, as very little has been improved over the previous generation, aside from the bump in hardware, and unfortunately for Asus, the competition did not rest in this last year. 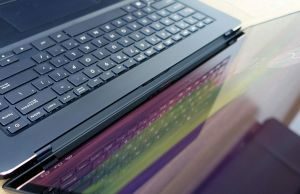 The updated Dell XPS 9570 is still a better computer with a nicer screen, sturdier build, bigger battery and more efficient Max-Q graphics this time, which could be worth the premium Dell asks for it, while the HP EliteBook 1050 and Lenovo ThinkPad X1 Extreme are also newer alternatives to consider. 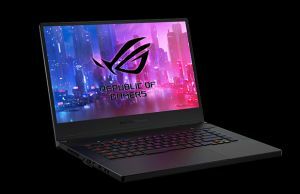 On top of these, those interested in gaming should also consider the more powerful GTX 1060 ultraportables like the MSI GS65, Razer Blade 15 or Gigabyte Aero 15x. 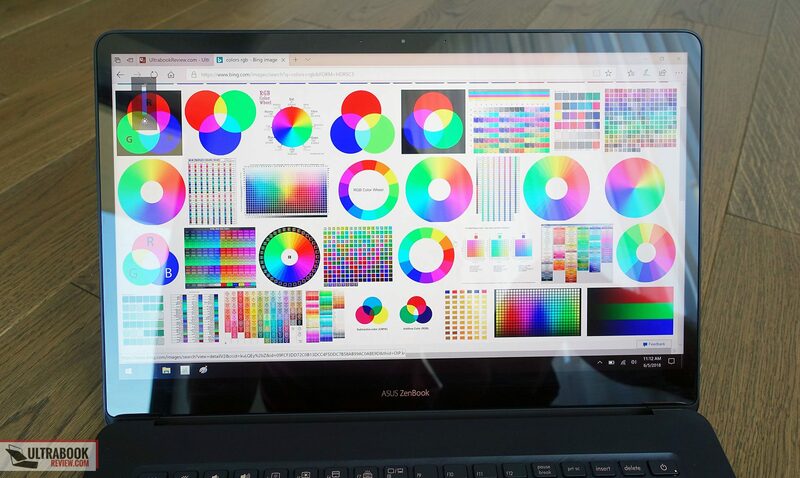 Anyway, that pretty much draws the line on this 2018 Asus Zenbook Pro UX580. We’ll update our impressions as the final retail versions are released, and in the meantime let me know what you think about it and get in touch in the comments section below if you have any questions or anything to add. 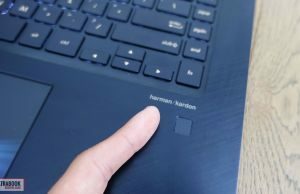 will an option be available without the touchpad touchscreen? As far as I understand, the UX550GD/GE will be available without the touchscreen. I have the UX550VD and for me the speakers are one of the biggest pros of this device so it’s disappointing to see asus go backwards in making the speakers rear firing. I agree with the screen not being too bright and the keyboard being a little mushy but that hasn’t bothered me too much so far since they’re still a huge upgrade over my last laptop. 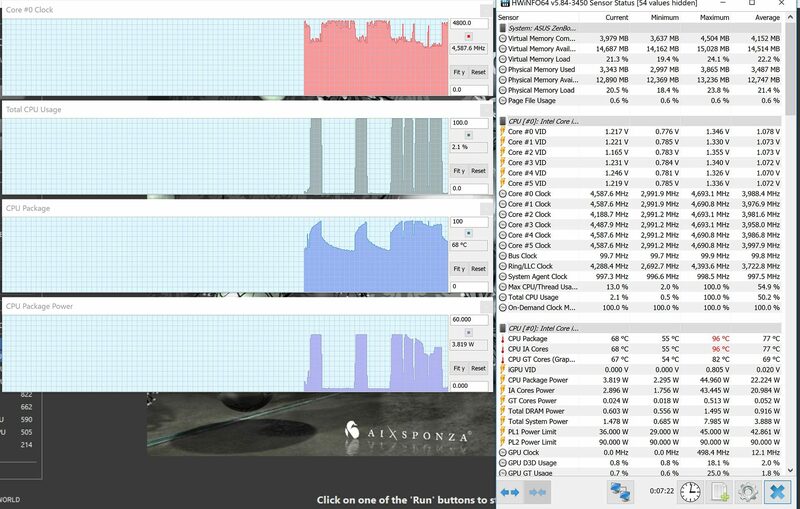 I usually only get 2-3 hours of battery life but I run a lot of programs simultaneously with tons of tabs open in chrome at max brightness so others will probably get better battery life than me. I’m usually near an outlet so it’s not really a concern. 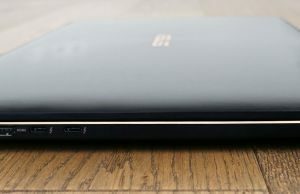 WiFi, touchpad, SSD, port selection, and general snappiness are all excellent plus it’s an amazing looking laptop. Hi Chris, thanks for your feedback. I think the VD and updated GD are the best buys on this device. As a portable multimedia/work laptop, this is a very good computer. good review, did you not review GL504GS andrei ? just like you did (GL503VS) few months ago..
And thank you for the actual technical review. It is full with videos of people taking about the specs for 3-4 min but that's not what's important. SO in this regard I'm very happy I found this material! Couple of questions: I have the ux550ve and before that I've had the ux501. The latter I returned because of coil whine. I found that to be an issue in the ux550 as well but it's only in quiet environment and right now I can't be bothered to send it to service even though after ux580 out I might do it. The question is if you have actually noticed coil whine in this model? Also are spekers really louder than ux550's ? I doubt it a bit since they are only bottom facing..
Not coil whine, but I did notice a little bit of electronic grinding, but only noticeable in quiet places. I can't tell for sure if the speakers are louder, but my impression is that they are not. They're not bad either though. Wow, nice to hear that they finally fixed it! 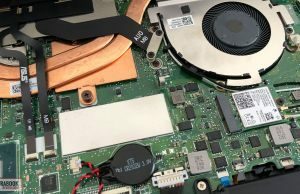 I understand the electronic grinding is from fans or motherboard? In my unit I've noticed that it changes depending on the game I'm playing, very peculiar. Can't tell for sure, it's coming from the components, but I couldn't pinpoint exactly the source. 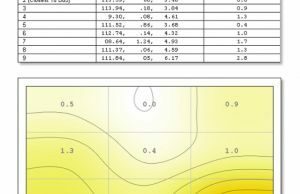 Also, coil whine is a lottery, the fact that I didn't get it on this sample doesn't mean other units won't run into it. I understand. Thank you for the info! Hey, I just want to say that I got the UX580GE a few days ago, and I quite noticeably hear coil whine on my device. Just wanted to give a heads up, as it seems that it is a lottery, and not that they have fixed it. Sry to hear that. Coil whine is unfortunately a lottery with a lot of laptops these days. 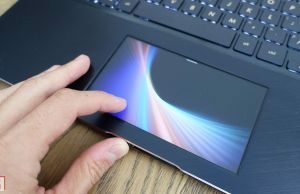 Hi, how is the touchpad compared to macbook pro? I use it for retouch and on a macbook pro I can use the trackpad for retouch. However on PC's that normally not the case, its just not the same. When it is going to be available in UK and the price? Should be fine, but even so I wouldn't buy the i9. Stick to the i7, undervolt and it should do fine. Why is that? 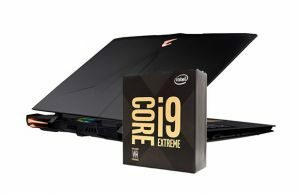 i9 are not good yet? Fit and finish on the sides of the device (where the ports are) seems bad. 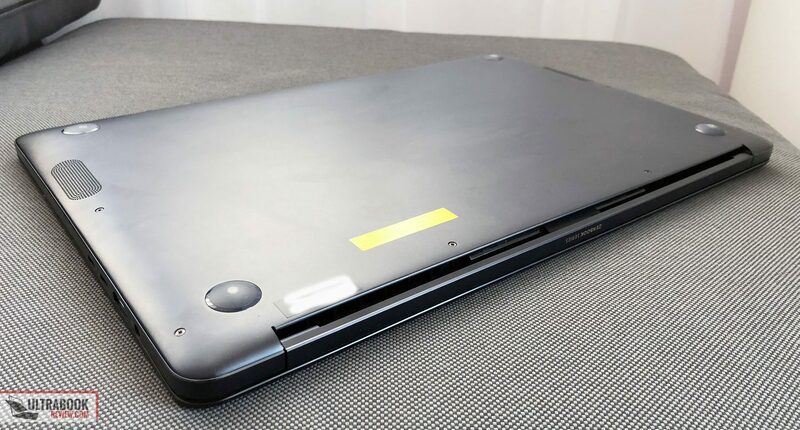 The unit looks like it has a ton of scratches from the machining process (not talking about the chamfered edges, but the actual sides of the laptop). Can you confirm this? 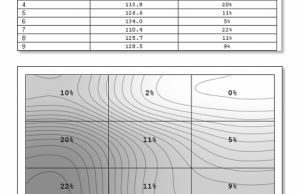 I can sorta make it out on the presentation pictures and on my UX550GD unit. can you post some pictures on imgur so I can have a look? I uploaded 3 images that show the issue. The scratches are random and not have any pattern to them unlike the brushed pattern on the keyboard deck and screen lid. 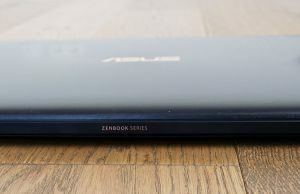 I don't remember this kind of finishing on any of the UX550s or the UX580 that I had my hands on ( https://www.ultrabookreview.com/17143-asus-zenbook-ux550-review/ ). Not sure if they've changed the process, but that doesn't look very good. I'd ask for a replacement or at least contact the store and ask if that's normal. I don't think it should be. 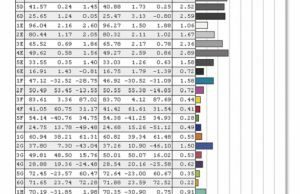 After doing some research on the internet (basically looking for high res images so I can zoom in), I found multiple articles on the UX550G/UX580 that show the exact same issue. 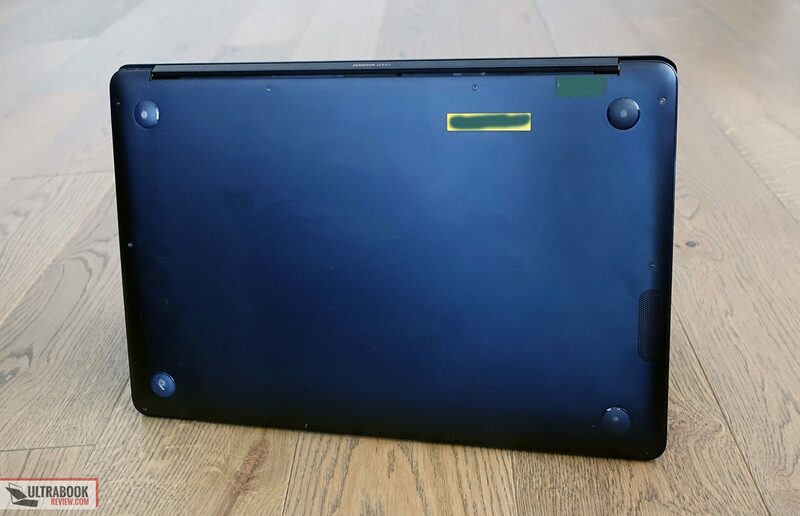 It's difficult to notice if you quickly glance at first because the laptop has a dark color and you need sufficient light to see but the sides are scratched like hell. I say this is unacceptable for a premium laptop (and frankly, for any laptop). It doesn't affect the functionality but I care about the aesthetics enough for this to become a big issue for me. This laptop will be difficult to charge on the road. You would need a 300 watt inverter to charge it according with discussions with Samlex. I decided to return the laptop as a result as I planned to take it on the road with me and will need to charge it. Many thanks for your detailed review. 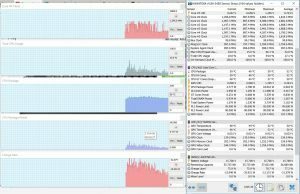 "As soon as you start some programs, the two fans increase their speed. Unfortunately, they also react very quickly to load changes, which leaves a somewhat nervous impression." Could you tell me your impression of the fan behaviour, please? Or, is there a possibility to influence the fan behaviour? Hi Chris. 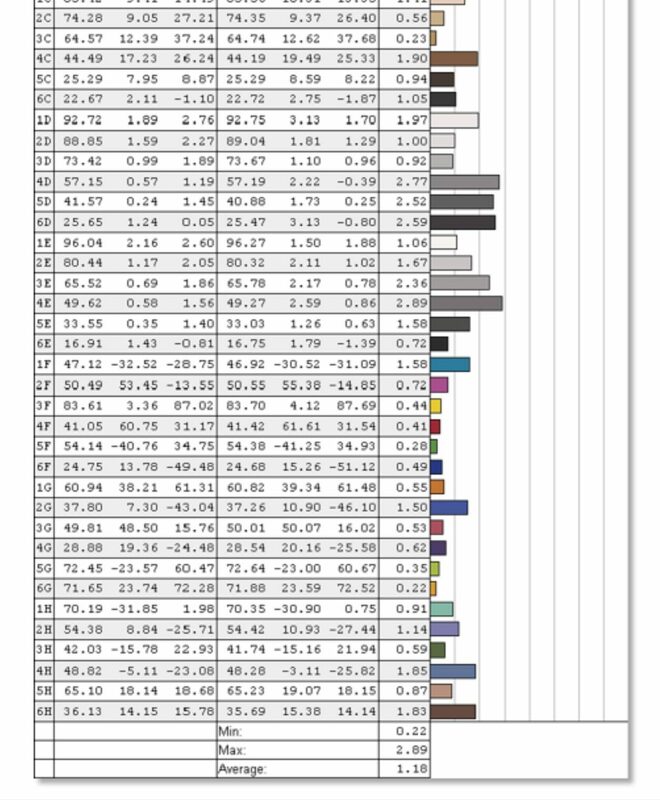 I've documented the fan noise in the article. As far as I remember the fans kept to low, barely audible, levels, with daily use, and ramp up with games. As far as I know, the 2018 models get different fans than the 2017 version, with asynchronous fins, and should be quieter. There's no official way to tweak the fans' rpm as far as i know, but you might be able to use something like Throttlestop. Good question, but I don't have an exact answer. As far as I know this doesn't charge via TB3, but I'n not 100% sure on that. I'd contact Asus and ask them directly about it. did you find an answer, so far, to your question? Did you have any issues with running 1080p fullscreen games or applications while the desktop was set to 4K? I have the UX550GE and 1080p fullscreen has a lot of lag unless I turn down the desktop resolution to 1080p (to which the games I play run perfectly). I made sure I'm using high performance with the NVIDIA GPU being used, so I'm suspecting the integrated GPU or explorer.exe is messing it up. 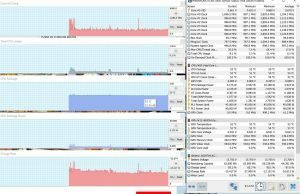 Killing explorer.exe using Razer Cortex boosts performance significantly, but it still lags a bit and it's not ideal since I can't change volume among other things. Hmmm, not that I remember. Perhaps you can search the forums on notebookreview or reddit for similar issues. 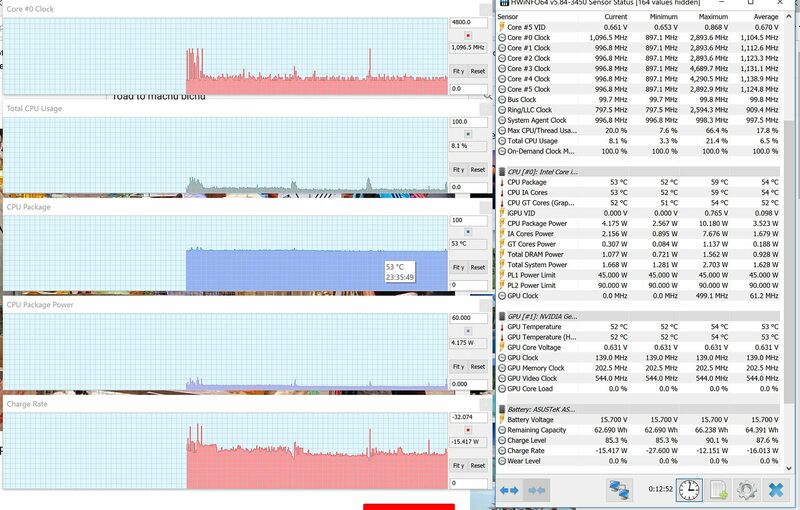 You can monitor the GPU's activity with HWinfo and see if it's working properly, and at the same time looks into the runnign processes and see of there's something messing things up.